It was heartbreaking to read, on Christmas day, that Eartha Mae Keith (a/k/a Eartha Kitt) has exited the planet after 81 years of making our lives more magical. Variety refers to her as an international symbol of elegance and sensuality. 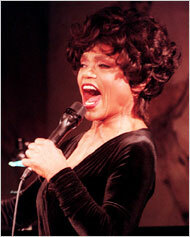 Kitt was a true diva who earned two Emmy® Awards, two Tony Awards®, and a Grammy®. Kitt was a groundbreaking performer who rose from the Jim Crow South to become an internationally celebrated performer. In our opinion she was the BEST incarnation of Catwoman on the old Batman series. Read more details about the life of this amazing entertainer at The Los Angeles Times and The New York Times. This is so sad, most "young" people have no idea of Eartha's music and talents and most only know her from the awful 60's Batman series, she will be sadly missed..